A chronicle of American politics, society, reform, and many facets of culture in the years between 1815 and 1848. America experienced unprecedented growth and turmoil in the years between 1815 and 1848. lt was an age when Andrew J. Jackson redefined the presidency and James K. Polk expanded the nation’s territory. David S. Reynolds captures the turbulence of a democracy caught in the throes of the controversy over slavery, the rise of capitalism, and the birth of urbanization. He brings to life the reformers, abolitionists, and temperance advocates who struggled to correct America’s worst social ills, and he reveals the shocking phenomena that marked the age: violent mobs, P. T. Barnum’s freaks, all-seeing mesmerists, polygamous prophets, and rabble­rousing feminists. He places America’s major writers—Emerson, Thoreau, Whitman, Poe, Melville, and Hawthorne—as well as artists such as Thomas Cole, Asher B. Durand, and George Caleb Bingham against this zestful social and political background. 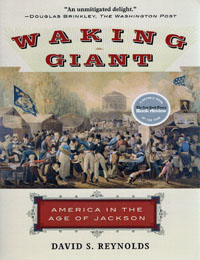 Meticulously researched and masterfully written, Waking Giant is a brilliant chronicle of America’s vibrant and tumultuous rise.